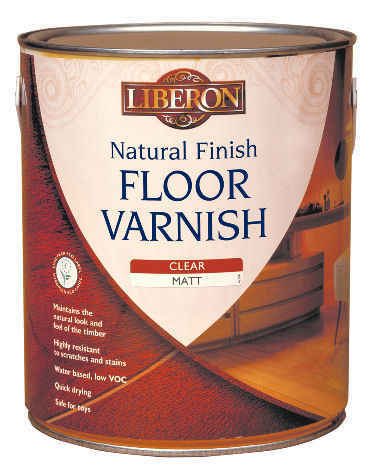 Liberon Natural Finish Floor Varnish is a hard wearing water based varnish which is ideal for use on soft or hard wood flooring. Keeping the natural feel and look of the timber Natural Finish Floor Varnish uses a non-yellowing and quick drying formula. Sand the floor if required and remove all previous finishes. 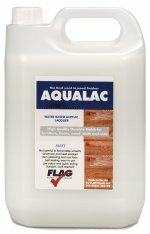 Ensure the surface is clean, dry and dust free. Shake / stir well before use. Apply a reasonable coat of Natural Finish Floor Varnish evenly using a paint brush or short hair roller and allow to dry for a minimum of 2 hours before applying further coats. We recommend a minimum of 3 coats are applied, sanding lightly between coats if required. More coats may be required for heavy traffic areas. Allow the final coat of varnish a minimum of 24 hours drying time before using the floor. Allow all wood dyes to dry for a minimum of 8 hours before applying Natural Finish Floor Varnish. Care must be taken on the application of the first coat of Natural Finish Floor Varnish when being used over Liberon Palette Dye. Keep brush strokes to a minimum as over brushing may lift out the colour. The varnish may raise the grain on some hard woods. Always test product on a spare surface or inconspicuous area for colour compatibility and end result. Product may slightly darken some woods.